The following information was excerpted from the Georgia Revised Statutes , Title 2, Chapter 10. 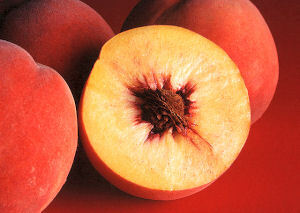 The peach is designated as the official Georgia state fruit. HISTORY: Code 1981, § 50-3-70, enacted by Ga. L. 1995, p. 362, § 1. Georgia Grown Peaches: Georgia Department of agriculture. History of the Georgia Peach: NPR. 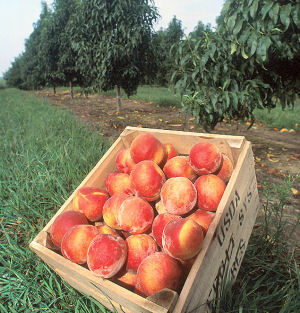 Prunus persica (L.) Batsch: Peach: USDA, NRCS. 2004. The PLANTS Database, Version 3.5 (http://plants.usda.gov). National Plant Data Center, Baton Rouge, LA 70874-4490 USA. : United States Department of Agriculture: Forest Service. Fact Sheet ST-513, October 1994.. The rise of Georgia blueberries: NBCNews. Peach Rosaceae Prunus persica (L.) Batsch var. persica: Virginia Tech, Department of Forestry: College of Natural Resources Fact Sheet..
Prunus persica Peach: Bioimages from the Department of Biological Sciences of Vanderbilt University. 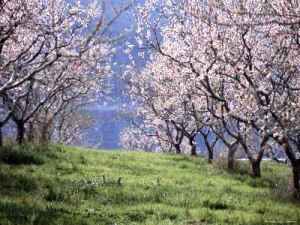 Prunus persica (Peach): CalPhoto photographs. The Biodiversity Sciences Technology group (BSCIT), a part of the Berkeley Natural History Museums at the University of California, Berkeley. Peach Prunus persica (L.) Batsch: Integrated Taxonomic Information System (ITIS) Here you will find authoritative taxonomic information on plants, animals, fungi, and microbes of North America and the world. State Fruit: Complete list of official state fruit. More symbols & emblems: Complete list of official Georgia state symbols. How to Pick a Peach: The Search for Flavor from Farm to Table , by Russ Parsons. 432 pages. Mariner Books; Reprint edition (May 1, 2008) "Eat locally, eat seasonally." A simple slogan that is backed up by science and by taste. The farther away from the market something is grown, the longer it must spend getting to us, and what eventually arrives will be less than satisfying. Although we can enjoy a bounty of produce year-round -- apples in June, tomatoes in December, peaches in January -- most of it is lacking in flavor. In order to select wisely, we need to know more. Where and how was the head of lettuce grown? When was it picked and how was it stored? How do you tell if a melon is really ripe? Which corn is sweeter, white or yellow? 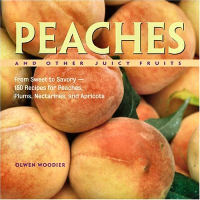 Peaches and Other Juicy Fruits: From Sweet to Savory, 150 Recipes for Peaches, Plums, Nectarines and Apricots , by Olwen Woodier. 192 pages. Storey Publishing, LLC (June 1, 2004) Peaches. Plums. Nectarines. Apricots. They're summer's sweethearts. Eating them fresh off the tree, still warm from the sun, is one of the high points of the year. Award-winning cookbook author Olwen Woodier offers stone fruit lovers 150 enticing ways to savor these sweet and tangy flavors of summer. The Great Southern Food Festival Cookbook: Celebrating Everything from Peaches to Peanuts, Onions to Okra , by Mindy Henderson. 320 pages. Thomas Nelson (November 4, 2008) A food festival is a wonderfully American event that happens in small towns and large cities all over the South, celebrating everything from onions to peanuts, chocolate to chowder. This collection will be both cookbook and travel guide with delicious recipes and festival information for more than 70 festivals from Virginia to Texas. Southern food and Southern parties-or rather Southern parties about Southern food-are the very best kind. Peach Cookbook: Beverages, Breakfast Treats, Appetizers, Soups, Salads, Entrees, Desserts , by Mimi Brodeur. 128 pages. Stackpole Books; Spi edition (March 30, 2009) Sweet and succulent, peaches are America's favorite fruit. In Mimi's newest book of original recipes, peaches maintain their starring role in desserts, such as sumptuous peach ice cream, peach schnappy creme brule, and peach upside-down cake with rum cream. But the fruit adds new character depth to other dishes--buttermilk peach muffins or blackberry peach French toast for breakfast, peach bruschetta or chilled peach soup for an appetizer, and smoke-rubbed skirt steak with peach chive butter or spicy pork spareribs with peach glaze for a main course at dinner. A variety of recipes for beverages--from sparkling peach lemonade to peach crantini--are included as refreshing accompaniments. The Organic Gardener's Handbook of Natural Insect and Disease Control: A Complete Problem-Solving Guide to Keeping Your Garden and Yard Healthy Without Chemicals , edited by Barbara W. Ellis and Fern Marshall Bradley. 544 pages. Rodale Books; Revised edition (May 15, 1996) An excellent handbook with entries for common fruits, flowering plants, vegetables, and trees. Each listing has information on disease and pest problems and tips on how to solve them without chemicals. Especially useful sections feature photos of garden insects and diseases. In Defense of Food: An Eater's Manifesto , by Michael Pollan. 256 pages. Penguin Press HC, The (2008) In looking toward traditional diets the world over, as well as the foods our families-and regions-historically enjoyed, we can recover a more balanced, reasonable, and pleasurable approach to food. Michael Pollan's bracing and eloquent manifesto shows us how we might start making thoughtful food choices that will enrich our lives and enlarge our sense of what it means to be healthy.